Liz is a creative strategist, designer, and fellow savvy entrepreneur. She helps her clients impress their audience, stand out from the competition and make more sales. Liz’s sweet spot is designing sales pages (and boy, is she good at it!). To learn more, visit her website or check her out on Instagram! Below, you'll find a written summary of this masterclass. Enjoy! 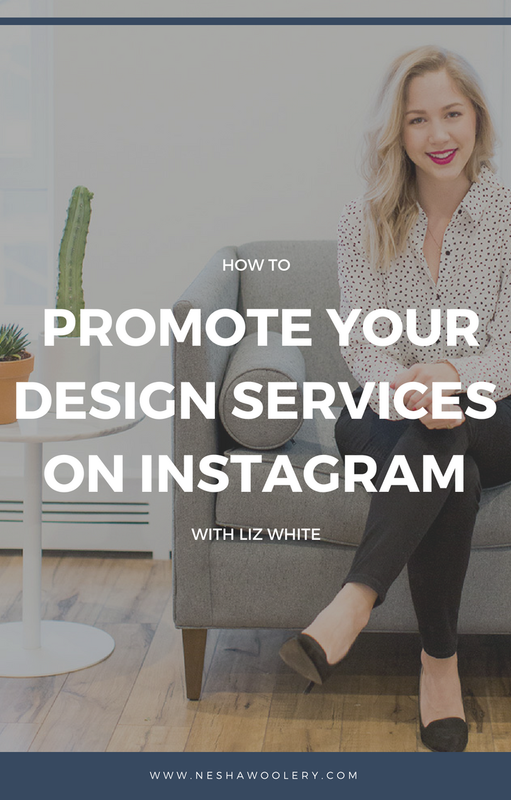 This month's masterclass is called 'How To Promote Your Design Services On Instagram.' My cohost, Liz White of the Linea Mae design studio, finds most of her clients via Instagram. In this masterclass, she shares her best tips for turning likes and followers into paying clients! Be sure to follow her beautiful Instagram account and watch her stories to see how she works her marketing magic. Keep your business and personal accounts separate. Almost everything you post on your business account should be centered around what your followers (aka. potential clients) are interested in or struggling with. We hate to break it to you, but your potential clients are not interested in seeing photos of your dog, as cute or fuzzy as he may be. If you want to share personal stories or photos, use Instagram Stories. The videos/photos you post on your story disappear after 24 hours. It's the perfect way to share what you're doing throughout your day, post personal photos and share a behind-the-scenes look at your business! Keep your really personal photos on a separate account. Both Liz and I have a business account and a personal account. Our personal accounts are followed by only our friends and family, and we keep it on Private so our business communities can't follow us there. Both Liz and I almost exclusively use stock photos on our Instagram profiles. It takes a complete load off of our shoulders because it eliminates the need to spend lots of time taking and editing pretty photos. Click here to see Liz's favorite stock photo resources! Liz's Instagram profile and website are branded and perfectly lead on from each other. She uses photos that include the same colors as her website or the same themes as her website photos to achieve this. Using stock photos isn't 'cheating'. They help your profile look professional and make posting to Instagram easier for you. If you'd like to customize your stock photos, choose photos that include an iPad/laptop and display your work on it like Liz has in this post. Use hashtags to drive traffic to your account. Instead of posting the hashtags in the post caption itself, hide them in a comment on that post so your caption doesn't look messy and long. Liz doesn't fill her posts with designer-related hashtags because that's just going to get other designers looking at her posts. She wants potential clients to look at them. So, she uses hashtags her potential clients use. If your potential clients are photographers, for example, find a hashtag they use often, such as #risingtidesociety. Then search that hashtag on Hashtagify to see related hashtags. Utilize as many hashtags as you're able to use (which is 30). Both Liz and I link to a newsletter freebie from our profiles. 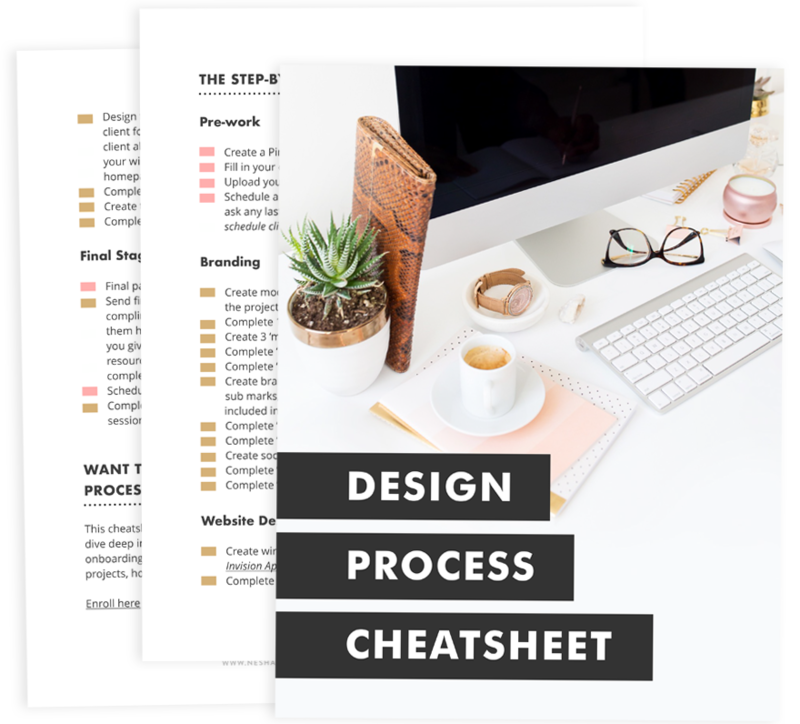 In Liz's case, she specializes in designing sales pages, so she has a Sales Page Checklist as her opt-in freebie and she links to that from her Instagram bio. When potential clients find her profile and read her bio, they aren't just lead to her website. They're pushed to opt-in for her newsletter so she can keep in touch with them and remind them how she can help them! Liz uses Linktr.ee to add links to her bio. It lets you add multiple links to your Instagram bio! Liz and I use a free app called Preview App. It allows you to plan out your profile visually, add captions and schedule posts. It's the perfect way to schedule posts in advance! Why Does Your Instagram Profile Only Attract Other Designers? In short, it's probably because you're following a lot of designers and using a lot of hashtags designers love. The first step to attracting non-designers is simply to unfollow the designers you currently follow and start following potential clients.You'll find that a lot of them will follow you back! Especially if you leave a thoughtful comment on one of their photos. Unfollowing other designers helps ensure you don't get stuck in the comparison trap. Goodbye fraudy feelings! Posting once a week isn't good enough. You're not going to see ANY results from that. Liz and I both post once a day and we do daily Instagram stories. Since posting regularly, we've both met lots of clients and collaborators on Instagram. Our Instagram profiles are filled with beautiful images but there's only a headshot of us once every nine posts. However, people can see our faces every day on our Instagram stories! They can watch our stories to get to know our personalities. This is key in converting followers into clients. After all, no one wants to hire someone they don't feel connected to, and the best way to create that connection is through video. Click here to learn what Instagram Stories are. Follow me (Nesha) to watch my daily Instagram stories. Follow Liz to watch her daily Instagram stories. Treat your Instagram posts as mini blog posts. Provide your followers with lots of free value that's connected to what they're struggling with, then link that Insta post with an opt-in to get your followers onto your email list. Don't do hard sells all the time but do them occasionally. It's GOOD to notify people of when you're next booking clients. They'll want to know after devouring all the free value you've been giving them! If you find a potential client you'd love to work with, follow them and comment on their posts when they post them. Don't go through their last 10 posts and comment on all of them with one-word comments because that's just sleazy. Instead, turn on post notifications so Instagram tells you when they'e posted, and comment on those new posts! The best way to get noticed by a potential client on Instagram is to direct message them. Reply to Instagram stories. Most people don't reply to stories, so doing this will help YOU stand out! Another tip: Mention them in an Instagram story. (Click here to find out how.) It's a great way to get someone's attention and show them how much you appreciate what they're doing. Once you've built that connection with potential clients, you'll be on their radar. Find a few hashtags your potential clients use by looking up past clients and seeing the tags they've been using. Then use Hashtagify.me to enter one of the hashtags and see related hashtags! Choose about 30 hashtags and add them as a note on your phone. You can copy and paste these hashtags on each of your posts! After watching the masterclass/reading the summary, you understand you need to use Instagram stories. But what should you use them for?! Day 01: Introduce yourself! Tell your followers who you are, what you do, and a few fun facts about you. Day 02: Show your workspace. Take your followers on a video tour! Day 03: Show behind-the-scenes of your latest project. Day 04: Show your followers your daily routine. Day 05: Share a tip related to your expertise. Then tell people to click the link in your bio to opt-in for a freebie related to your tip. Day 06: Get personal. Show your pet/family/something fun you're doing. Day 07: Talk about your latest blog post and direct people to it. Look for ten potential clients and follow them. Then, turn on post notifications for each of them by following the instructions here. Reply to their Instagram stories. No one replies to stories so doing this will help YOU stand out. Mention them in one of your stories. This is the best way to get on their radar and show them you're into what they're doing. It's the perfect way to build a relationship with them before reaching out and letting them know you'd love to work with them!